Joseph Morris comes to Spokane by way of Orlando, Florida. He credits his love of crab and other fresh seafoods to visits with family in the Baltimore area. Morris brought all of these flavors with him to his studies at the Inland Northwest Culinary Academy, and now to Luna, where he's been for about 6 years. RESTAURANT WEEK: What was your journey to become a chef? 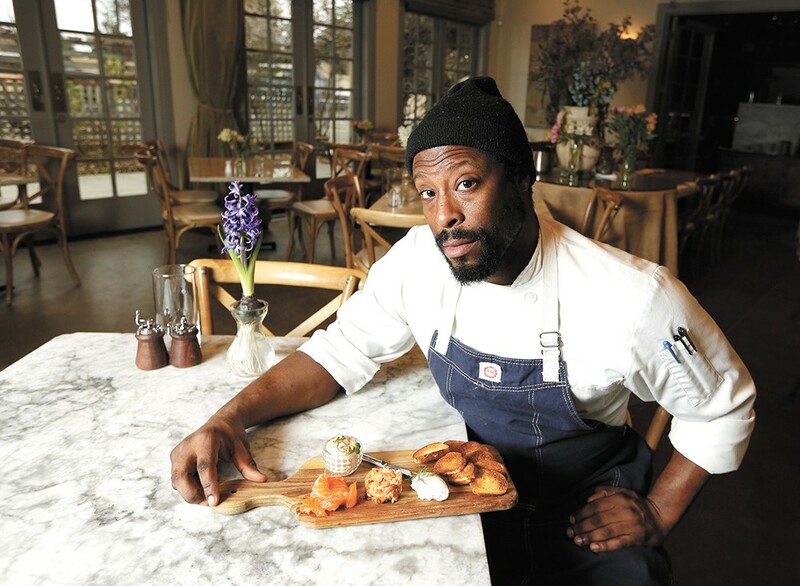 MORRIS: I've always enjoyed food, and I've always been at my most comfortable in the kitchen. So I just evolved from there, went to culinary school and continued to push myself and learn from every experience inside the kitchen and out. What do you love best about cooking in our region? I love the fact that everything food-wise is at our fingertips. We've got really great farm lands; though we're not on the coast, we still are very close to great fresh seafood. We have an awesome wine region — there's just so much that the Northwest provides. Describe your philosophy of food and dining out. When it comes to food and dining out, I want to create or add to a great experience. I want the diners' total dining experience to be an awesome one. Everything plays a part. From the moment you're seated, to the vibe in the dining room, to when you receive your first plate, the goal is to give you a memorable experience from top to bottom. Who are some of your culinary heroes and why? The first culinary heroes of mine are my grandma Jordan, my mother and my aunties. These women not only made tremendously good food, but they also showed me the power that food possesses. I was able to see how it brought people together, how it could create joy and awe, how it could inspire and motivate. As far as professional chef heroes, Daniel Humm and Marcus Samuelsson. Daniel Humm opened my eyes and made me see food and dining on a whole other level. Through him, I saw how food can be simple yet complex, I saw how you can reinvent food but yet still keep it familiar. Marcus Samuelsson was the first black man who I saw really just be a beast in the kitchen. Just seeing him in action and reading about his experiences motivated me on a very personal level. It's awesome to now see African American chefs, such as Eduardo Jordan and Joseph Johnson, starting to really make an impact in the culinary world. They motivate me personally to try and leave my mark in the culinary world. What do you most appreciate about the local food scene? That it is starting to grow! It's great to see new and unique places popping up here in Spokane. What do you like best about Restaurant Week? Restaurant Week gives people who wouldn't normally come visit your restaurant a reason to come and dine at your restaurant! It's also a platform to showcase what your restaurant is all about. The original print version of this article was headlined "Joseph Morris"